On the day of Zoe’s diagnosis, I could never have imagined that I would owe childhood cancer any gratitude. But in a strange and improbable way, I do. I am grateful that it taught me to let go of anxiety (all that worrying never prevented cancer did it?) and find joy in the everyday, as Zoe did even on the worst days of her treatment. I am grateful that I had to stop trying to manage everything myself and learn to accept the kindness of family, friends and strangers. It’s made me a kinder, more empathetic person. I am grateful and honoured to know the men and women who dedicate their lives to saving chemo kids’ lives. The career of some of the oncologists at Starship spans the period where ALL (a type of Leukaemia) went from a 10% survival rate to a 10% mortality rate. I am grateful that Zoe felt so loved by the nurses who cared for her. (The doctors, she didn’t feel the same about, though she maintained a very giggly flirty relationship with her primary Oncologist. Yes three year olds can flirt). I am grateful to have had the support of volunteers and organisations dedicated to making the quality of chemo kids’ lives as good as it can be, and the strangers who donate to make that possible. 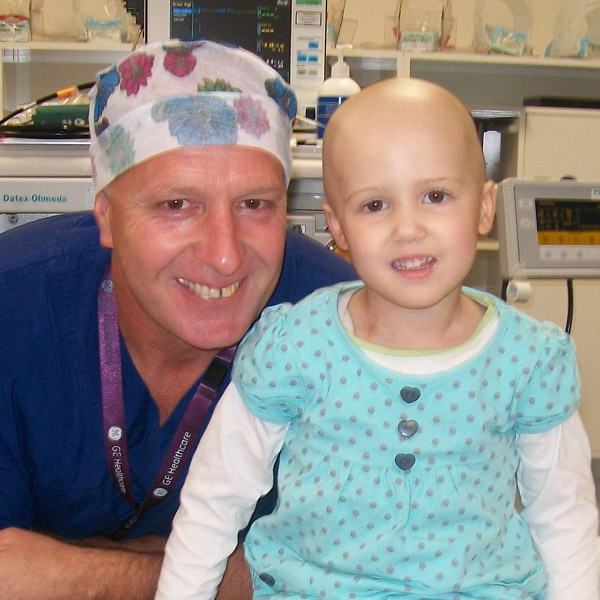 I am grateful that her hero, Dr Harry, agreed to grant her wish and was such a worthy hero. She might not ever have found him if it wasn’t for childhood cancer. I am grateful for how the experience shaped Zoe into a deeply empathetic and thoughtful little person. I am grateful to have met some amazing children on this journey, survivors, those still on treatment and some who like Zoe did not survive. I am grateful to have met their parents, some of who have become very special friends. I am grateful that I met others who have walked this path before me and shown me how. I am grateful that I can do the same for others who walk behind me. I am grateful that I had six and half years to get to know the beautiful soul of my daughter. I am grateful for the two and half years she had in remission, for all of the living, fun and joy we packed into it. I am grateful I never asked for Zoe’s prognosis, so I could live those years without it hanging over us. I am grateful that when Zoe’s cancer returned, it advanced so swiftly, we didn’t have to make the hard choices between quality and quantity of life. It was too late for those. I am grateful that for that reason, she didn’t have to face losing her hair again. I am grateful that Zoe got to spend the last few weeks of her life with her mother and her father spending all their time together with her. She never gave up on that. While every day I wish she was with me, some days I am grateful that she never had to learn how full of hate and brutality the world can be. I still (often literally) curse childhood cancer every day. But I also recognise the strange gifts that it brought us. Are you improbably grateful for the lessons and people you found through some difficult experiences or circumstances? You’re welcome to share your thoughts here. This post was written for 1000 Voices for Compassion’s November theme. Bloggers from all over the world publish on the themes on the 20th of every month. You can find their facebook page here, their website here, or search the #1000speak hashtag on twitter. Click here for the link up to see all of the November posts in one place. Thank you so much Lizzi. If any of my writing serves as a signpost to others I am humbled and grateful for that too. It always amazes me when I share Zoe’s story and someone chooses to share theirs in return how privileged I feel by that and what a powerful connection we can create with other humans by sharing our hearts. I want to express my deepest gratitude for inviting me into such a deeply personal story and sharing your journey with such vulnerable, honest authenticity. Being “allowed in” is always a privilege. One I never take for granted. Thank you for giving me such a rich gift. Thank you so much. I’m not sure exactly why I feel compelled to share such a personal story, but the fact that other people seem to get something out of it is I think part of the answer. I feel like Zoe’s story should have something good come from it. In the words of Andrew Solomon (great Ted Talk) I guess I am forging some meaning from it. Feeling compelled…I get it! Silencing it is exhausting. For me, I’m a different person. Called or compelled have become almost the same for me. I think, no I know, we both have a story to tell. A message to share. It’s been a long time since I’ve felt this fulfilled and confident. And I have not even started sharing parts of my story yet. That’s the part that’s hard and freeing at the same time. You go girl!!! See where your writing takes you ! I can only imagine how hard it was to watch your daughter go through this. You’ve done an amazing job at finding the positive things to hold on to. Sorry for your lose and a little envious of your gains (though I really don’t want to walk in your shoes!). An inspiring post. I wish no-0ne had to walk in my shoes! It’s certainly ironic that it takes hard times to learn lessons you value, but just wish you didn’t have to go through these things to learn them. So true. The greatest lessons often come with loads of pain. I guess what we learn is our compensation for hanging in there. This is heartbreakingly beautiful, Kiri. I don’t personally know any children who’ve had to endure cancer or life-threatening illnesses, but learning their stories (either survivors or not) and knowing that childhood cancer exists at all… it’s hard not to cry. Thank you for writing this, and for reminding us that we really can find reasons to be grateful for the most trying experiences in our lives. Hi Sara, so glad something in this touched you. Sadly you probably will know a child with cancer in your lifetime as the rate is around one in three hundred children before the age of 20. I am grateful for people like you sharing their story. In doing so, you teach us to love with our full hearts each & every day. None of us know what tomorrow will bring, we must embrace the precious time we are given with our loved ones. As everyone else has said, this post is beautiful. Thank you so much for sharing your memories of your wonderful daughter with 1000 Voices. Thanks Yvonne, I’m looking forward to reading more posts on the link up. This is such a lovely post. I liked reading it. We find wisdom, love and compassion in the most unexpected places in life and this is why life is wonderful, mysterious, unfathomable and beautiful. Indeed 🙂 Darkness makes us appreciate light even more! I was thinking about my brother as I read your post, and how at the tiime of his murder, not one little thing was worthy of anything but my fury and despair. But time did settle the heart and let a little light in. I’m capable of gratitude, even though there are still tears all these years later. Oh my gosh. One thing I didn’t mention that I am very grateful for is that although Zoe’s final illness was swift, everyone got to say the goodbyes they needed to say. I cannot imagine how that must have been for you. I’m glad that you are now capable of gratitude but can only imagine what a dark place that was. Love and light to you. Also after reading your subsequent comment I wanted to say I definitely didn’t arrive at some of these gratitudes immediately. Plenty of tears and anger along the way (and still also).